Workwear for Construction, Engineering, Manufacturing, Automotive Mechanics, Factory, Nursing and Healthcare workers. Your staff are your brand ambassadors so they should look good and meet safety requirements of the job. Decorate their uniforms with embroidered and screen printed logos and contact details. Get workwear for the right image. High Visibility, Durable and career specific apparel for your industry. This easy care dress shirt is a utility shirt for any industry! If you need a classic uniform for trade, food and beverage, hospitality, sales and office work this short sleeve number is a workhorse for workwear in most occupations. Dress your logo up with corporate wear. Features: 65% Polyester 35% Cotton twill. 150 g/m² (4.4 oz/yd²). Safety comes first on the worksite with quality high visibility workwear, but don’t be shy to add you business logo. These unisex Sumaggo High Visibility polyester fleece Hoodie with 3M Scotchlite reflective strips will get your team and name noticed. 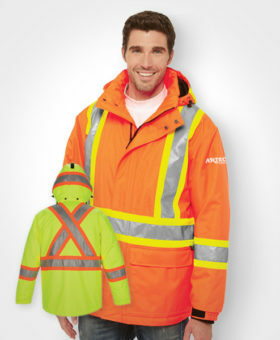 Safety comes first on the worksite with quality high visibility workwear, but don’t be shy to add you business logo. These unisex Sumaggo High Visibility Long Sleeve T-shirts with 3M Scotchlite reflective strips will get your team and name noticed. Safety comes first on the worksite with quality high visibility workwear, but don’t be shy to add you business logo. These Sumaggo High Visibility T-shirts with 3M Scotchlite reflective strips will get your team and name noticed. If you are looking for a quality low priced polo shirt for your staff workwear or golfing tornament uniform then this is as good as it gets! Features: 100% polyester snag resistant, with antibacterial and wicking finish, short sleeve polo. If you are looking for a quality low priced polo shirt for your staff workwear or golfing tournament uniform then this is as good as it gets! Our best prices for classic t-shirt brands printed with one location one colour screen printing. We have much more to offer so if these options don’t fit your requirements then use the link below to find the t-shirt that you want to customize for your business, event or team. Need More Options? Go to the t-shirt section to see all styles, colours and decoration available. This Full Zip DyBlend Hoodie by Gildan has you wrapped up on frosty spring and fall mornings. Features: 50% Cotton / 50% polyester • preshrunk 13.5 oz. Air jet yarn = softer feel and no pilling • Unlined hood with color-matched flat drawstring • YKK metal zipper.